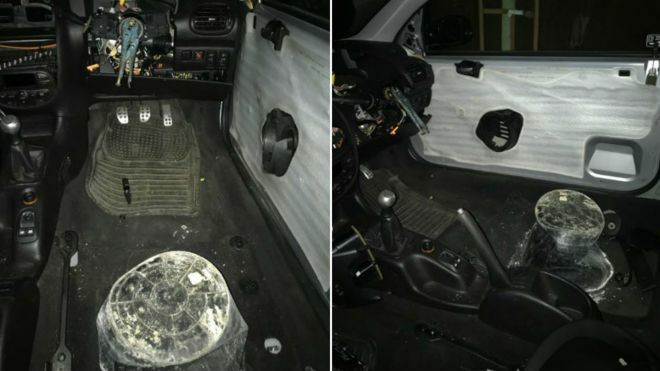 A motorist was stopped by police for driving while sitting on a bucket and steering with pliers. The battered car, which also had no front wing, bumper, headlights and a flat tyre was pulled over in King's Lynn in Norfolk. 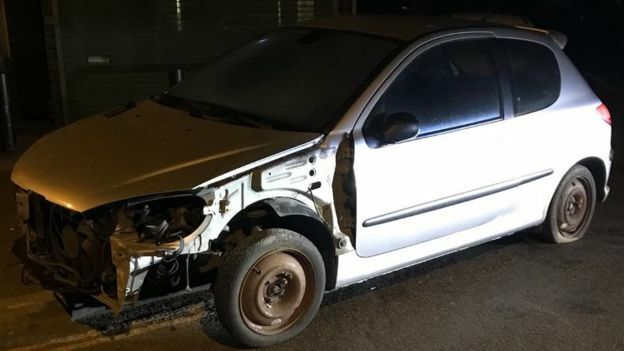 Norfolk's roads policing unit tweeted pictures of "the most un-roadworthy car" and said there were "too many offences to mention". Police said the driver has been reported to court. "Yes this was driven on a road and yes he was sitting on a bucket and steering with a pair of mole grips," officers wrote, as they posted pictures of the vehicle in Saddlebow Road. Dozens of people have commented on the shocking state of the vehicle. One person referred to a television series where contestants compete to build working machines from scrap, saying: "I think too much scrap heap challenge has been watched by that driver." Another said it "gives a whole new meaning to the word bucket seat", while other tongue-in-cheek comments included someone calling it "ingeniously unbelievable". One person commended the driver on a "nice bit of kerb parking", considering he only had a pair of locking pliers to steer it neatly to the side of the road.